Organized for the fifth time in Turkey, the Turkish Airlines Open was part of the European Tour's Rolex series this year. The tournament, held between Nov. 2 and Nov. 5 at the Regnum Carya Golf Club in Belek, Antalya, saw English golfer Justin Rose clinch the title and $1.17 million in prize money. Over the years, the contest has become one of the world's most important golf events and surely the biggest in Turkey. The revenue Golf generates sets it apart from other sports and there is a full-blown tourism sector that centers on it. After all, no golfer would ever want to miss an opportunity to watch star-golfers play and test themselves on the same course. That makes the fact that the final series of the European Tour was held in Turkey, even more important. Like its earlier editions, this year's Turkish Airlines Open was thoroughly enjoyed by all the percipients, thanks to the organizers, sponsors Turkish Airlines, and above all the fans. But, one name should not go without mentioning, Ahmet Ağaoğlu, the president of the Turkish Golf Federation. Ağaoğlu was the mastermind behind the event and his efforts to develop the country's golf scene, since he took office in 2000, have been widely praised. Two years ago he said, "I am not going to die before the Ryder Cup is held in my country," and those who know him and his love for golf can tell that he would do everything in his ability to make that happen. On the sideline of a fierce title battle, the Turkish Airlines Opens also saw the Guinness World Record broken for the fastest hole by a team of four. England's Tyrell Hatton, Matt Fitzpatrick, Ian Poulter and Matthew Southgatethey broke the record by completing the 458-meter long 15th hole at the Regnum Cara Golf Course in just 32.70 seconds. The previous record was 34.87 seconds, which was broken last year in Valderrama by a French team of four. The English lads beat South Africa (32.96 seconds) by just 0.26 seconds. You can check out the video of the world record attempt on YouTube (https://youtu.be/5ZkbL_qZRE0). 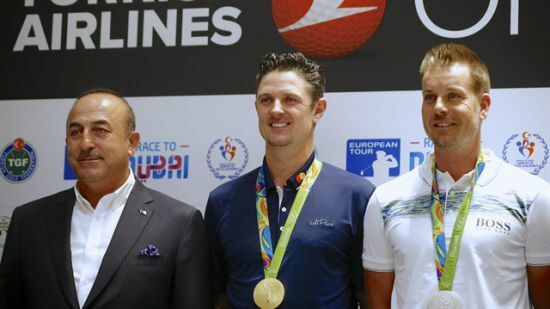 The Turkish Airlines Open also organized a "Drone Golf Championship," participated by the likes of Martin Kaymer, Shane Lowry, Ian Poulter and Henrik Stenson. Kaymer and Lowry won the championship after Lee Westwood won last year's title. Drone Golf involves contestants controlling their drones to drop the ball as close to a hole as possible.